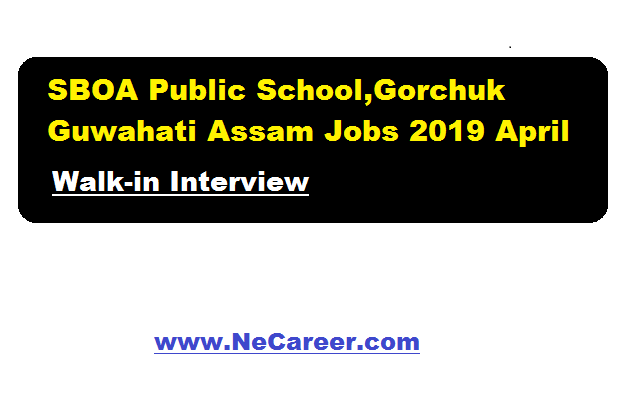 SBOA Public School,Gorchuk Guwahati Assam Jobs 2019 April - PGT/TGT/Librarian/PET/Computer Teacher:- Welcome to North East India's No. 1 Job Portal NeCareer.com . SBOA Pubilc school was started in August 1994 with 8 students and three classes- L.K.G U.K.G and class I. Year by year the school has been growing and in March 2002. The school has been upgraded to Senior Secondary level in 2009 with Science, Humanities and Commerce stream in level class XI and XII. According to SBOA Public school recruitment in April 2019, applications are invited for filling up various posts. Essential Qualification: Candidates must be M.Sc Chemistry with B.Ed. Essential Qualification: Candidates must be B.Sc Mathematics with B.Ed. Essential Qualification: Candidates must be Graduate with Diploma in Library Science, Master of Library & Information Science will be given preference. Essential Qualification: Candidates must be Bachelor of Physical Education. Essential Qualification: Candidates must be JBT/D.El.Ed Graduate (Assamese) with B.Ed will be given preference. Essential Qualification: Candidates must be BCA/DOEACC A Level . Interested candidates may appear tor a Walk-in-interview on 12th of April 2019 at 10 a.m at the school premises with all original as well as photocopies of certificates along with 2 PP size photographs. Candidates without requisite qualifications need not apply. Forward your resume at: sboacareer@gmail.com. Candidates having teaching experiences in reputed School would be considered for appropriate adjustment in pay scale commensurating to no of years of experience. EPFO/ESIC Health Insurance coverages are also available.